Cryopreservation of testis tissue is a promising approach to save fertility in prepubertal boys under going gonadotoxic cancer therapies. The using biopolymers as a basis of cryoprotective medium can be effective for the optimization of cryopreservation protocols of immature testicular tissue. 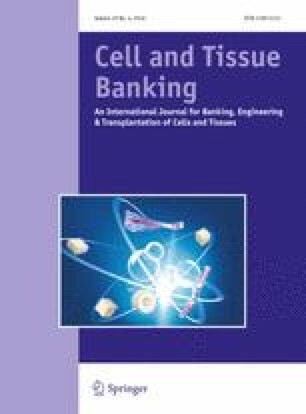 The research purpose was to determine morphological parameters and metabolic activity of seminiferous tubules of immature rat testes under exposure to cryoprotective solution (DMSO) based on collagen or fibrin gels (CG or FG) as one of the first stages of developing the cryopreservation protocol. It was found that 30-min exposure of tissue samples to CG and FG with 0.6 M DMSO did not impair the spermatogenic epithelium and metabolic activity of the cells (MTT test and total lactate dehydrogenase activity). The use of FG at the time of exposure of 45 min did not lead to significant changes in the metabolic activity in contrast to other groups. The findings could be used to substantiate and develop the effective techniques for cryopreservation of immature seminiferous tubules. This study was carried-out within the research project of the National Academy of Sciences of Ukraine (No. 2.2.6.99). All the manipulations with animals were carried out in accordance to the European convention for the protection of vertebrate animals used for experimental and other scientific purposes (Strasbourg, 18.III.1986). The protocols were approved by the Bioethics Committee of Institute for Problems of Cryobiology and Cryomedicine of the National Academy of Sciences of Ukraine (Permit No 2016-05).